Dynasty 1 xxxForm: Palette of Narmer from Egypt's Dynasty 1 dated circa 3100 BCE is in low relief and made out of mudstone. It is stylized and subtractive with relatively little or no depth. It is fairly symmetrical with balanced features on both sides and stands approximately 25" in height. The Palette is about 6" thick and convex. It is has been carved in low relief on both sides. The figures are generally in composite view and it is highly stylized. In this view all the body's features but the torso are shown in profile, the torso exhibited from the frontal point of view. The palette's front features Narmer with the White Crown of Upper Egypt. 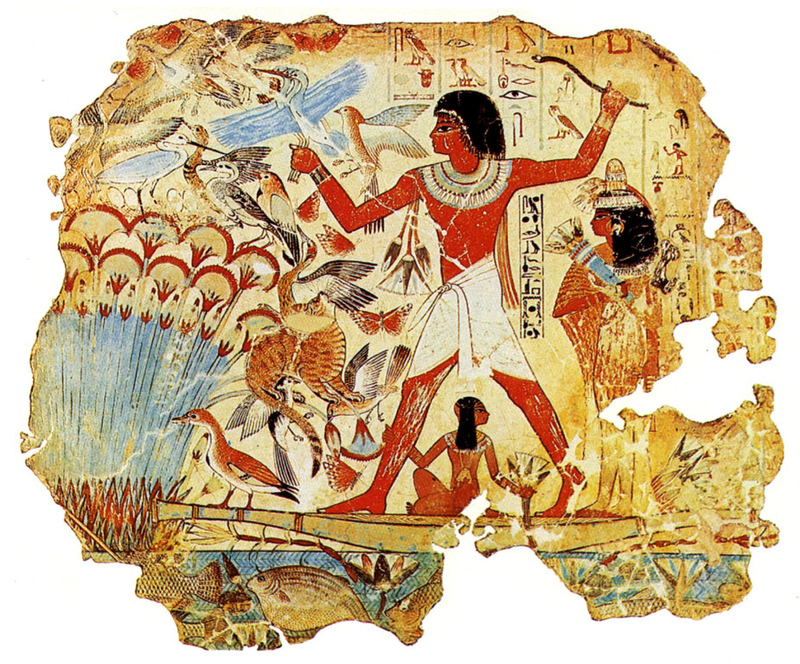 Behind him is an attendant holding his sandals and to the right is a falcon holding a rope with a human head. The falcon is perched upon papyrus while Narmer is ready to bring his enemy down. Below Narmer are two dead people. 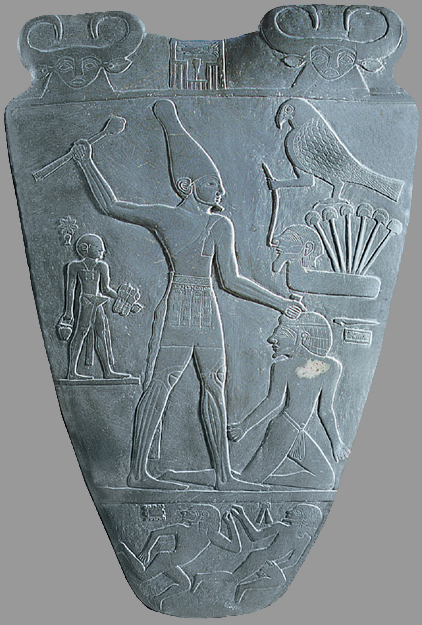 On the back of the palette Narmer is wearing the Red Crown of Lower Egypt behind him is his attendant holding his sandals and in front of him are his minister of state and for men. In front of them are decapitated bodies with a falcon watching them. Below two men hold onto feline creatures who's necks are entwined around the indentation in the palette. Below, a bull out side of the gates of the city is harassing an enemy or is knocking down he walls of a city. The picture plane is divided in registers that define space and stories. Iconography: Stokstad refers to the composite view as a "memory image" in her section concerning "Representations of the Human Figure," Stokstad's discussion discusses this canon or formula of proportion as being fairly symbolic, therefore, the composite view can be both formal and iconic. When a figure, like the larger figure of the king, is displayed in such a way that all attributes of the physical body are shown at the same time. Composite view was often used to establish social/hierarchical status, which explains why Narmer is depicted in such a way. He was an Egyptian aristocrat. Also, the composite view may have been intended to portray perfection and thus enhance the image's supernatural power. Composite view would be then be really useful in tomb art, since the early Egyptians believed that the spirit of the dead could enter a secondary body in the afterlife. 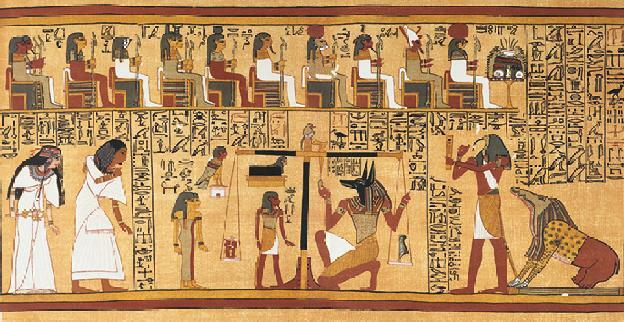 Similarly hieratic scale is both a formal device as well as iconographic. Usually, the larger the figure, the more important they were to society. 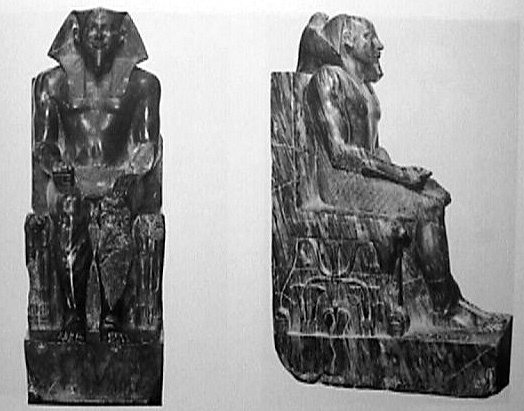 Narmer is noticeably larger than the other figures and this suggests that their roles were more inferior. The iconography of the palette is complex and somewhat relates to the development of the pictographic system of writing called hieroglyphics. The square at the top and in the middle on both sides of the palette and next to Narmer's head on the back of the palette is symbolic of the ruler's name. The fish symbolizes (nar) and the vertical chisel is a symbol for (mer). The cows on either side are a symbol for the goddess Hathor. The large figures of Narmer is a symbol of his power and divine status. The falcon is a symbol for the god Horus. The papyrus is a symbol of lower egypt. 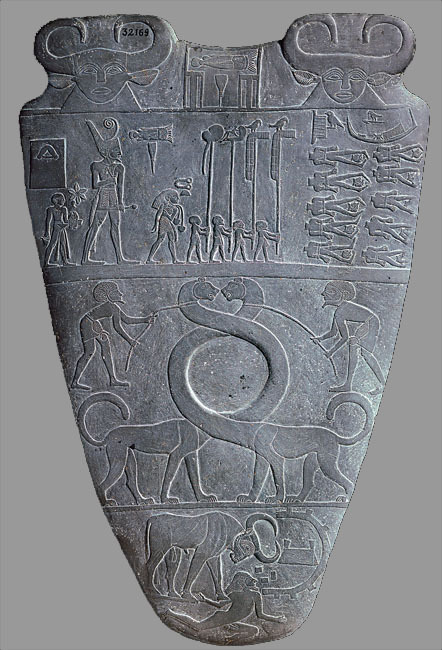 The four men in front of King Narmer on the back of the palette are holding things that maybe symbols of different regions of Egypt. The entwined necks of the felines may be a symbol of unity. 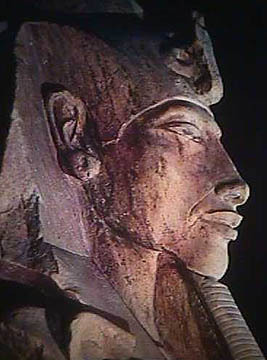 King Narmer wearing both the White and Red Crowns symbolizes that he rules both Upper and lower Egypt. The Bull is another symbol of his power and virility. Context: King Narmer who had been a minor official in Upper Egypt rose to power and conquered Lower Egypt around 3100 BCE. He and his successors: established a theocratic political system over the entire navigable length of the Nile. King Narmer either unified Upper and Lower Egypt or began the process of unification that was completed in the first dynasty. Palettes were used to grind pigments that were worn as eye paint. This eye paint was worn by both men and women to reduce infections and to reduce the glare of the sun. Dynasty 18 Context: Much of the art and architecture of ancient Egypt is based on the belief in the afterlife as outlined in the Egyptian "Book of the Dead" which is a kind of Egyptian guide or bible of religious thought. 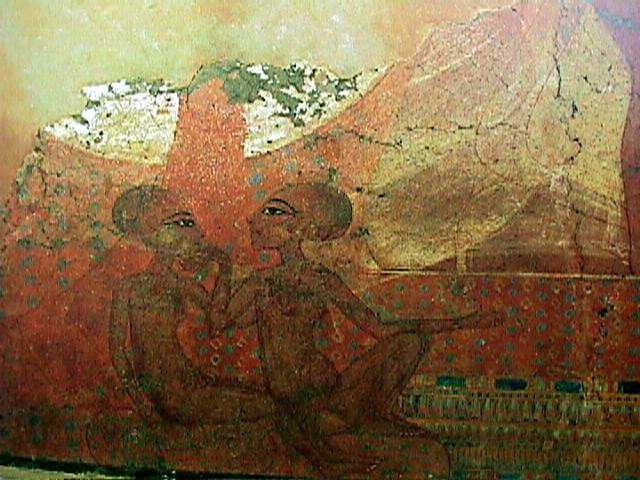 This painting is form the tomb of Nebamun, a minor official and aristocrat in the Egyptian government shortly before or after the reign of King Akhenaton. The practice of creating tombs for the deceased was wide spread among the priestly and aristocratic classes in Egypt because their religion was devoted to the idea of survival in the afterlife. Although the bodies of the dead were preserved through mummification, frescos and sculptures depicting the inhabitant of the tomb were placed throughout it so that the individual's animated spirit or "ka" would have a replacement body to inhabit in the afterlife. Form: The figure of Nebamun is central in this mural dry painted mural (paint on dry plaster is referred to as fresco secco). He is rendered with idealized body in typical composite view and his size is exaggerated in accordance with hieratic scale. The scene is surrounded by hieroglyphic writing which either describes his activities or are prayers taken from the "Book of the Dead." Iconography: The idealized body and composite view of the figure is probably based in the desire to create an image that is the most perfect and complete and therefore the most magically potent. The scene is a genre scene. (A scene of everyday life.) Although a scene of everyday life, the iconography indicates his importance and his place in Egyptian society. 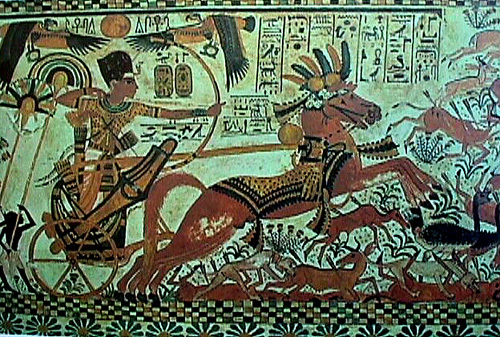 He is larger than the figures of his wife and daughter and he is depicted going about a leisure activity hunting on the Nile. The genre elements represent his status, the types of activities he enjoys, and his abilities (has caught three birds) he enjoys as one of the elite in the afterlife. Dynasty 18 Form: Some of the earlier Egyptian conventions of depiction (the "memory image and composite view) are not followed in this image. Although the two women on the left have been portrayed in a classic manner, the middle two are shown in a very unusual frontal and naturalistic position. In the depiction of the figures arms is a bit of an attempt to show foreshortening of the limbs. As their arms project into the foreground they become shorter to create the illusion of space. The two figures to the far right are overlapping also creating a slight illusion of space. Iconography and Context: These dancing girls were probably meant as entertainment for Nebamun in his afterlife and were not very high in the cultures hierarchy. The break from tradition in depicting these figures could represent the influence of Akhenaton's reign on Egyptian art but these distortions are most likely due to the relaxation of rules governing the depictions of lesser known or less important individuals as in the depiction of the Seated Scribe 2525 BCE from Saqqara, Egypt. Context: The egyptians had to go through many tests to see how much they would be rewarded in the after life. One of these tests was the weighing of the heart of the person who has died against a feather. If the heart weighed more than the feather then Ammit was allowed to eat it and the person was not allowed into heaven. Papyrus of Ani, 1280 BCE Thebes, Egypt Dynasty 19 Context: Below is a translation of one of the prayers from the "Book of the Dead" found on a specific scroll called the Papyrus of Ani. Read this text and think about how it might relate to the iconography and ideas expressed in depictions of the "Book of the Dead." Originally from the Papyrus of Ani, with revisions and reorganization to better suit the modern servant of the gods. I have not turned the earth without cause. I have not taken milk from the mouths of children. I have not made anyone hungry by means of my greed. I have not deprived a humble man of his property. I have not exploited the weakness of any man. I have not disturbed the air without cause. I have not befriended evil men. I have not demanded undo praise for my name. I have not destroyed any just man's work. I have not driven any man to act against another. I have not extinguished the fire in its season. I have not done anything that is hateful in the eyes of the gods. I have not stolen offerings from the altars of the gods. I have not committed unclean acts in the sanctuaries of the gods. I have not turned away from any god in fear or shame. I have not held back the water in its season. I have not caused misery to those around me. I have not inflicted suffering or pain. I have not made anyone weep with sorrow. I have not committed evil against mankind. Maintained by the Rev. Dr. Corey Bantik, who can be contacted at bantik@interaccess.com. Dynasty 3 Form: It is a series of smaller mastabas stacked one on top of the other. It's corners are situated to the points of the compass and it originally had a limestone facade. 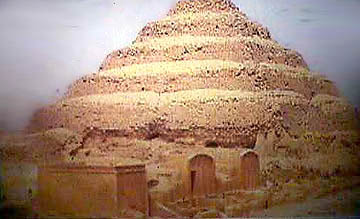 Iconography: The pyramid and the necropolis surrounding it are iconographic of the city that the king lived in when he was alive. This false city will allow him to live and walk through it in his death. The height of the pyramid may be an icon of a mountain which is often times seen as a bridge between the earth and the heavens. 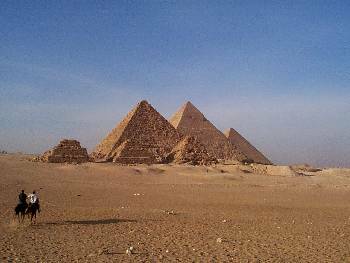 Dynasty 4 Form: Khufu's pyramid is the largest and was covered with a limestone veneer. Khafre's pyramid is the middle sized one, it was also cover with a limestone veneer. Menkaure's pyramid is the smallest and had a polished red granite base. The pyramids, themselves, are on the west side of the Nile. Iconography: The amount of time and effort put into the building of these pyramids is iconographic of how strongly the people felt that there kings happiness in the afterlife could effect the empire after his death. The pyramids are on the west side of the Nile because that is where the sun sets and this is iconographic of the connection between the Kings of the fourth dynasty and the sun god Re. These pyramids may also be iconographic of mountains and thus of a link between heaven and the earth. Context: These pyramids are one of the "seven wonders of the world" that the early Greeks named. It is the only of the "wonders" that is still in decent shape. They are where the ancient kings of Egypt were buried. The graves of the kings have all been robbed and the treasures that lied with the kings have been taken. In side of Khufu's pyramid he was buried at the heart of the pyramid but there were three false passageways found. It is not known if these were meant to trick grave robbers or just changes in the architectural plan. In the fourth dynasty the kings considered themselves the sons of the sun god Re, whose symbol was a pyramidal stone. A microgravimetry survey of the Great Pyramid in the 1980s yielded the enigmatic image at right. Less dense areas (indicated in green) seem to correspond to an internal ramp proposed by Jean-Pierre Houdin (diagram). (Dassault Systemes; Courtesy EDF) [LARGER IMAGE] Hidden ramps may solve the mystery of the Great Pyramid's construction. Of the seven wonders of the ancient world, only the Great Pyramid of Giza remains. An estimated 2 million stone blocks weighing an average of 2.5 tons went into its construction. When completed, the 481-foot-tall pyramid was the world's tallest structure, a record it held for more than 3,800 years, when England's Lincoln Cathedral surpassed it by a mere 44 feet. What we don't know is exactly how it was built, a question that has been debated for millennia. The earliest recorded theory was put forward by the Greek historian Herodotus, who visited Egypt around 450 B.C., when the pyramid was already 2,000 years old. He mentions "machines" used to raise the blocks and this is usually taken to mean cranes. Three hundred years later, Diodorus of Sicily wrote, "The construction was effected by mounds" (ramps). Today we have the "space alien" theory--those primitive Egyptians never could have built such a fabulous structure by themselves; extraterrestrials must have helped them. The first theory is that a ramp was built on one side of the pyramid and as the pyramid grew, the ramp was raised so that throughout the construction, blocks could be moved right up to the top. If the ramp were too steep, the men hauling the blocks would not be able to drag them up. An 8-percent slope is about the maximum possible, and this is the problem with the single ramp theory. With such a gentle incline, the ramp would have to be approximately one mile long to reach the top of the pyramid. But there is neither room for such a long ramp on the Giza Plateau, nor evidence of such a massive construction. Also, a mile-long ramp would have had as great a volume as the pyramid itself, virtually doubling the man-hours needed to build the pyramid. Because the straight ramp theory just doesn't work, several pyramid experts have opted for a modified ramp theory. This approach suggests that the ramp corkscrewed up the outside of the pyramid, much the way a mountain road spirals upward. The corkscrew ramp does away with the need for a massive mile-long one and explains why no remains of such a ramp have been found, but there is a flaw with this version of the theory. With a ramp corkscrewing up the outside of the pyramid, the corners couldn't be completed until the final stage of construction. But careful measurements of the angles at the corners would have been needed frequently to assure that the corners would meet to create a point at the top. Dieter Arnold, a renowned pyramid expert at The Metropolitan Museum of Art, comments in his definitive work, Building in Egypt: "During the whole construction period, the pyramid trunk would have been completely buried under the ramps. The surveyors could therefore not have used the four corners, edges, and foot line of the pyramid for their calculations." Thus the modified ramp theory also has a serious problem. The second theory centers on Herodotus's machines. Until recently Egyptian farmers used a wooden, cranelike device called a shadouf to raise water from the Nile for irrigation. This device can be seen in ancient tomb paintings, so we know it was available to the pyramid builders. The idea is that hundreds of these cranes at various levels on the pyramid were used to lift the blocks. One problem with this theory is that it would involve a tremendous amount of timber and Egypt simply didn't have forests to provide the wood. Importing so much lumber would have been impractical. Large timbers for shipbuilding were imported from Lebanon, but this was a very expensive enterprise. Perhaps an even more fatal flaw to the crane theory is that there is nowhere to place all these cranes. The pyramid blocks tend to decrease in size higher up the Great Pyramid. I climbed it dozens of times in the 1970s and '80s, when it was permitted, and toward the top, the blocks sometimes provide only 18 inches of standing room, certainly not enough space for cranes large enough to lift heavy blocks of stone. The crane theory can't explain how the blocks of the Great Pyramid were raised. So how was it done? The design of the internal ramp was partially determined by the design of the interior of the pyramid. Hemienu knew all about the problems encountered by Pharaoh Sneferu, his and Khufu's father. Sneferu had considerable difficulty building a suitable pyramid for his burial, and ended up having to construct three at sites south of Giza! The first, at Meidum, may have had structural problems and was never used. His second, at Dashur--known as the Bent Pyramid because the slope of its sides changes midway up--developed cracks in the walls of its burial chamber. Huge cedar logs from Lebanon had to be wedged between the walls to keep the pyramid from collapsing inward, but it too was abandoned. There must have been a mad scramble to complete Sneferu's third and successful pyramid, the distinctively colored Red Pyramid at Dashur, before the aging ruler died. Huge granite and limestone blocks were needed for the roof beams and rafters of the Queen's and King's Chambers. Some of these beams weigh more than 60 tons and are far too large to have been brought up through the internal ramp. Thus the external ramp had to remain in use until the large blocks were hauled up. Once that was done, the external ramp was dismantled and its blocks were led up the pyramid via the internal ramp to build the top two-thirds of the pyramid. Perhaps most blocks in this portion of the pyramid are smaller than those at the bottom third because they had to move up the narrow internal ramp. There were several considerations that went into designing the internal ramp. First, it had to be fashioned very precisely so that it didn't hit the chambers or the internal passageways that connect them. Second, men hauling heavy blocks of stones up a narrow ramp can't easily turn a 90-degree corner; they need a place ahead of the block to stand and pull. The internal ramp had to provide a means of turning its corners so, Houdin suggests, the ramp had openings there where a simple crane could be used to turn the blocks. A bit of evidence appears to be one of the ramp's corner notches used for turning blocks. It is two-thirds of the way up the northeast corner--precisely at a point where Houdin predicted there would be one. Furthermore, in 1986 a member of a French team that was surveying the pyramid reported seeing a desert fox enter it through a hole next to the notch, suggesting that there is an open area close to it, perhaps the ramp. It seems improbable that the fox climbed more than halfway up the pyramid. More likely there is some undetected crevice toward the bottom where the fox entered the ramp and then made its way up the ramp and exited near the notch. It would be interesting to attach a telemetric device to a fox and send him into the hole to monitor his movements! The notch is suggestive, but there is another bit of evidence supplied by the French mentioned earlier that is far more compelling. When the French team surveyed the Great Pyramid, they used microgravimetry, a technique that enabled them to measure the density of different sections of the pyramid, thus detecting hidden chambers. The French team concluded that there were no large hidden chambers inside it. If there was a ramp inside the pyramid, shouldn't the French have detected it? In 2000, Henri Houdin was presenting this theory at a scientific conference where one of the members of the 1986 French team was present. He mentioned to Houdin that their computer analysis of the pyramid did yield one curious image, something they couldn't interpret and therefore ignored. That image showed exactly what Jean-Pierre Houdin's theory had predicted--a ramp spiraling up through the pyramid. Far from being just another theory, the internal ramp has considerable evidence behind it. A team headed by Jean-Pierre Houdin and Rainer Stadlemann, former director of the German Archaeological Institute in Cairo and one of the greatest authorities on pyramids, has submitted an application to survey the Great Pyramid in a nondestructive way to see if the theory can be confirmed. They are hopeful that the Supreme Council of Antiquities will grant permission for a survey. (Several methods could be used, including powerful microgravimetry, high-resolution infrared photography, or even sonar.) If so, sometime this year we may finally know how Khufu's monumental tomb was built. One day, if it is indeed there, we might just be able to remove a few blocks from the exterior of the pyramid and walk up the mile-long ramp Hemienu left hidden within the Great Pyramid. 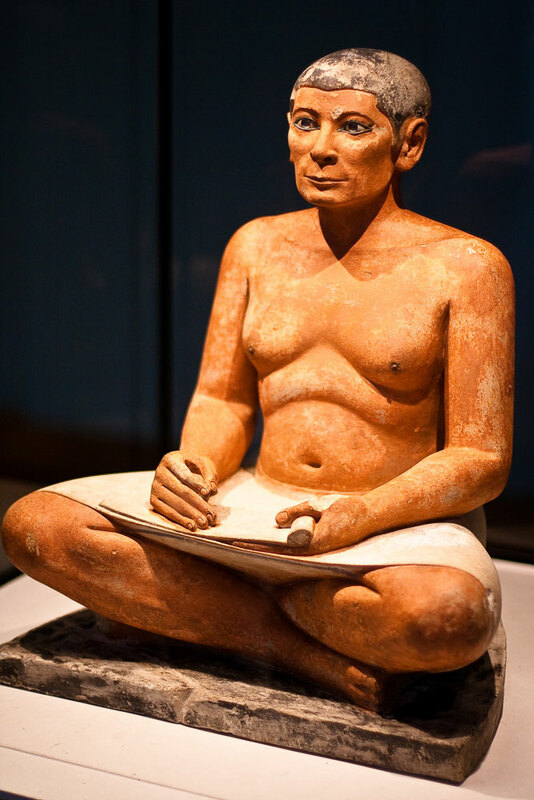 Dynasty 5 Form: This figure is extremely naturalistic. He is sitting cross legged holding a partially unrolled papyrus. In his right hand would have been a pen. He is flabby but he appears knowledgeable and alert. Iconography: The papyrus and missing pen ae icons of his trade and make it clear that he is a scribe. His flabby chest is iconographic of sedentary life style and age. The lack of idealization is also iconic of the scribe's status. Since he is a lesser individual in the hierarchy of Egyptian culture it is acceptable to render him in a more naturalistic fashion. Context: Scribes were expected to learn reading, writing, algebra, religion, arithmetic, and law. They were taught these things mainly by their fathers. The position of scribe was a fairly revered one. If they became well known they may be appointed to "houses of life" where books were copied and studied. The reason that this figure is so naturalistic in comparison to the portraits of the kings is because he is a lay person. The kings were thought to have been god like so they were depicted in an idealistic manner. Dynasty 4 Form: This is a frontally oriented statue that depicts Menkaure with his left foot out but with out the shift of weight at the hips that usually accompanies such a stance. His wife also assumes this stance in an exquisitely rendered see through dress. He wears a kilt, nemes headdress, and a false beard. His wife as one hand upon his arm and the other arm around his waste. This piece was never finished being polished and it was originally painted, as traces of the paint are still on the statue. Iconography: The headdress and false beard are icons of a king. The wearing of beards probably is an extension of the idea that facial hair indicates maturity and therefore wisdom. Context: This statue was originally in Menkaure's pyramid. This statue may have been created with the people in the poses that they are so that pieces were not likely to break off. 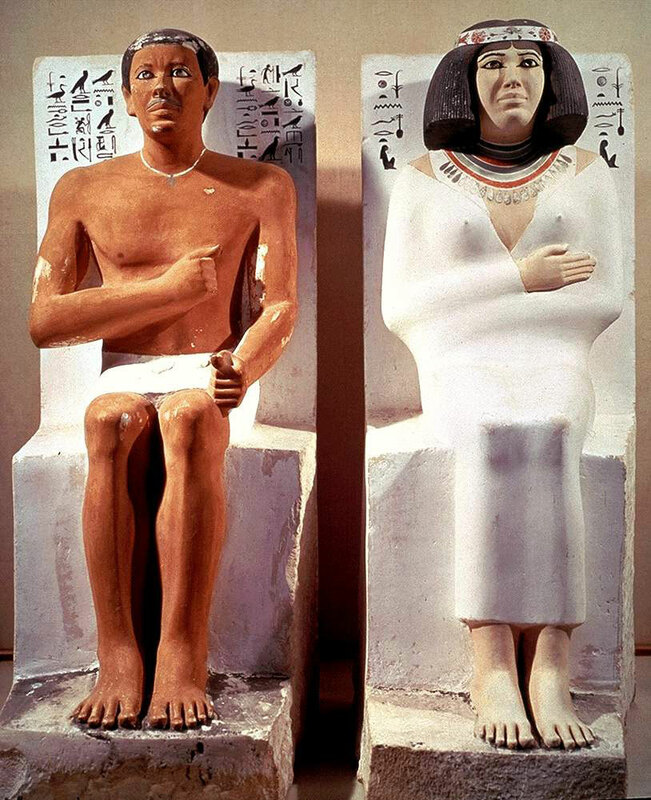 This statue was meant to house the ka's of the king and his wife if their mummies were destroyed. painted limestone Form: This statue is made of lime stone that was then painted. Prince Rahotep was painted darker wearing a kilt, short wig, mustache, and a heart amulet. Nofret was painted lighter wearing a robe with two straps, a heavy wig with her own hair coming down over her forehead, and a necklace with pendants. Their eyes are inlayed with stone; opaque quartz, transparent rock crystal, and black paste. Iconography: The darker color on prince Rahotep is iconographic of his male gender. 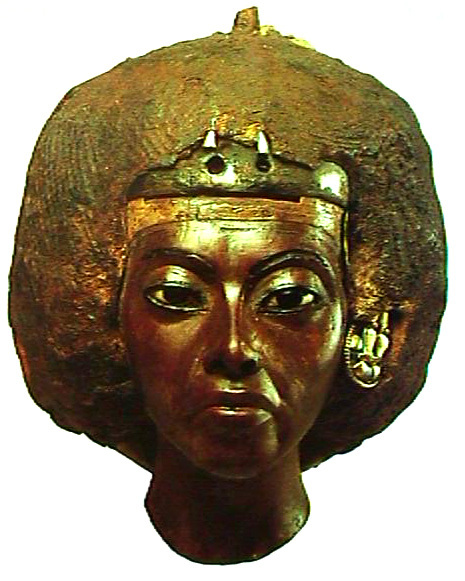 The lighter color on his wife Nofret is iconographic of her female gender. Context: the prince and his wife are sitting in judgment of the the world of the dead. 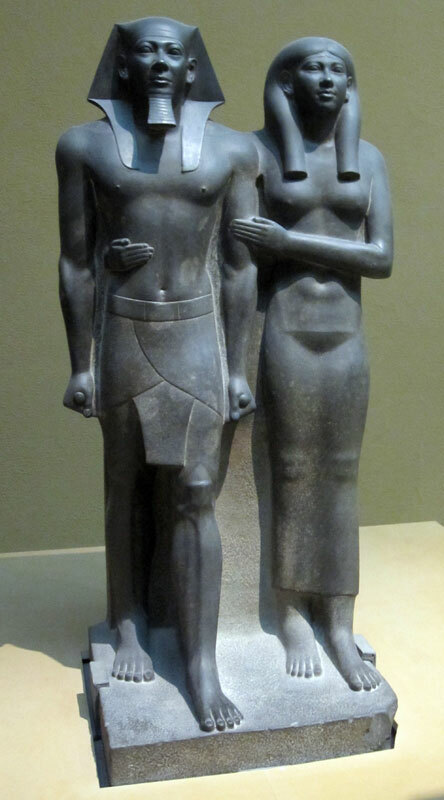 Ancient Egyptian law required that members of the royal family marry within their family, thus Rahotep and his wife Nofret were also brother and sister. Dynasty 4 Form: The statue is made of diorite. 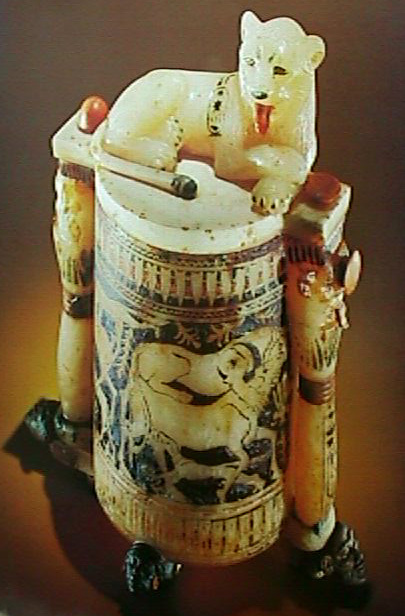 The king sits upon a throne that has stylized lions, lotus plants, and papyrus plants on it. He wears only a kilt and Horus spreads his wings over the kings head. He has a nemes headdress and a false beard. The kings body is idealized but is still a portrait. Iconography: The body of Khafre is iconographic of the body of a god. His nemes headdress and false beard are icons of a king. Horus's wings spread over the kings head are an icon of protection. The lions on the throne are symbols of a king and power. The lotus and papyrus plants are symbols of a united egypt. Context: Sculptors created this statue as a place for the ka to go if the mummy was destroyed. This statue was originally in Khafre's pyramid. Fresco secco (dry fresco): The artists would put plaster on a wall and let it dry before the painted it. They mixed beeswax with pigments to make paint. Horus: Horus is the son of Osiris and Isis. He is the symbol of an ideal son. He is usually depicted as being a falcon or as having a falcon head. Isis: Isis a goddess who is the mother figure. She is both the sister and the wife of Osiris. She was used as a symbol of the ideal woman. Ka: Is the Egyptian word for spirit or soul. Necropolis: Greek for "city of the dead". Osiris: Osiris is the father figure who is the founder of Egypt and its civilization. He is also the god of the underworld, death, and resurrection. Seth: Seth is a mix between a dog and a camel or a jackal or a pigs head. He is a trickster god who disordered the world. He is not evil he is just the opposite half. He is sometimes represented as an enemy who has to be eliminated. The earliest monuments of Amenhotep IV, who in his fifth regnal year changed his name to Akhenaton ("one useful to Aton"), are conventional in their iconography and style, but from the first he gave the sun god a didactic title naming Aton, the solar disk. This title was later written inside a pair of cartouches, as a king's name would be. The king declared his religious allegiance by the unprecedented use of "high priest of the sun god" as one of his own titles. The term Aton had long been in use, but under Thutmose IV the Aton had been referred to as a god, and under Amenhotep III those references became more frequent. 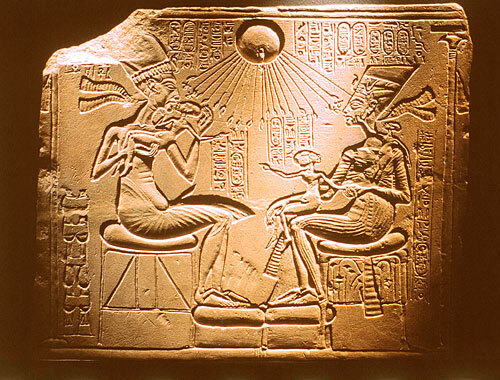 Thus, Akhenaton did not create a new god but rather singled out this aspect of the sun god from among others. He also carried further radical tendencies that had recently developed in solar religion, in which the sun god was freed from his traditional mythological context and presented as the sole beneficent provider for the entire world. The King's own divinity was emphasized: the Aton was said to be his father, of whom he alone had knowledge, and they shared the status of king and celebrated jubilees together. After the banishment of all Egyptian gods except Aton, Akhenaton limited artistic subject matter mainly to depictions of himself and his family, both in casual domestic scenes, which were his favourite, and in concert with Aton, who was shown as a golden orb radiating beams of light that ended in little hands proffering the sign of life, the ankh, to Akhenaton and his queen, Nefertiti. It was in the method of portraying the Pharaoh and his family that the most remarkable aspect of Amarna art lies, for the old stiff canon was abandoned in favour of a "naturalistic" depiction, which showed them more as actual human beings. Essentially it was a secularization of art that took place; the royal family was now shown in the same casual poses and settings as servants and commoners had been depicted in the past. Some experts see the depictions of Akhenaton himself--with an elongated head, slender neck and limbs, and protruding belly--as artistic overstatements of basically real physical attributes, possibly the result of a rare disease that deformed his head and hips. Whatever the reason, the expressionistic physical type eventually became canonized and was used to some degree in most depictions of human form throughout the Amarna period. Iconography: While still showing the traditional iconography of kingship: the crook, flail, beard and headdress, this statue's caricaturish naturalism is symbolic of all of the changes that have been made during Akhenaton's rule. Context: Akhenaton was the the ruler of Egypt during the eighteenth dynasty. Originally named Amenhotep IV, he changed his name to Akhenaton after the sun god Aton. He was known for instilling his ideas of monotheism and for his encouragement of creating art for everyday life rather than restricting them to tombs. He encouraged others to focus on the present rather on the afterlife. He moved the capital to a new site that he called Aton, named for the new god. He emptied all the other temples and erased the name Amen from everything, including his own name. Never is Aton represented in any way other than as sun rays, he does not take human or animal shape as the other egyptian god were prone to do. It is because of this new religion and philosophy that art changed drastically after this period. This introduced the new subject matter of depicting everyday life and the depiction of figures in a more caricaturish and less idealized manner. and larger facial features. The characteristics of the art shown above may be a portrayal of the transition from customary Egyptian art, which was directly related to the previous religion, to the new kind introduced by Akhenaton and influenced by his principles. 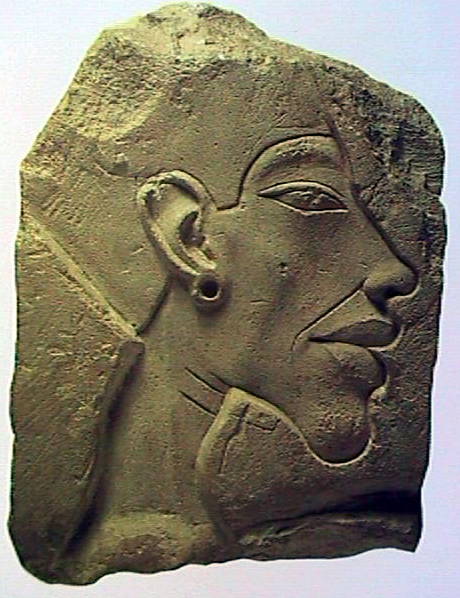 Dynasty 18 Form: Akhenaton has an elongated head and a very protruding chin. He has an elongated nose and droopy eyelids. He has very large ears and wears the traditional neme's headdress and false beard. Iconography: These features may be iconographic of inbreeding. The may also be an icon of the breach from tradition Egyptian art to the style that Akhenaton created. The nemes headdress and the false beard are symbols of kingship. Context: The evidence of inbreeding in the very beginning of the dynasties and at the very end is strong because it is documented. During the middle of the dynasty it is not very documented nor is it proven through DNA analysis. In a sunken relief, the outline of the design is first incised all around. The relief is then carved inside the incised outline, leaving the surrounding surface untouched. Thus, the finished relief is sunk below the level of the surrounding surface and is contained within a sharp, vertical-walled contour line. This approach to relief sculpture preserves the continuity of the material's original surface and creates no projection from it. The outline shows up as a powerful line of light and shade around the whole design. Dynasty 18 Form: This portrait is made from yew wood, silver, gold, lapis lazuli, cloth, clay, ebony, and alabaster. It is very naturalistic, it even shows her wrinkles. Iconography: This is an icon of Akhenaton's desire to wipe out all traces of the old religion. It is also an icon of the blood lines that make up Akhenaton. Context: Queen Tiy is the mother of Akhenaton and she was hs fathers main wife. She actively supported her son during his rule. This portrait was first made during the rule of her husband. In it she was made to look like Isis and Nephthys. When Akhenaton changed the religion it was altered because if portrayed the old gods. The headdress was covered and a plumed crown was attached, it is now missing but it would have looked like the one Nefertity wore. 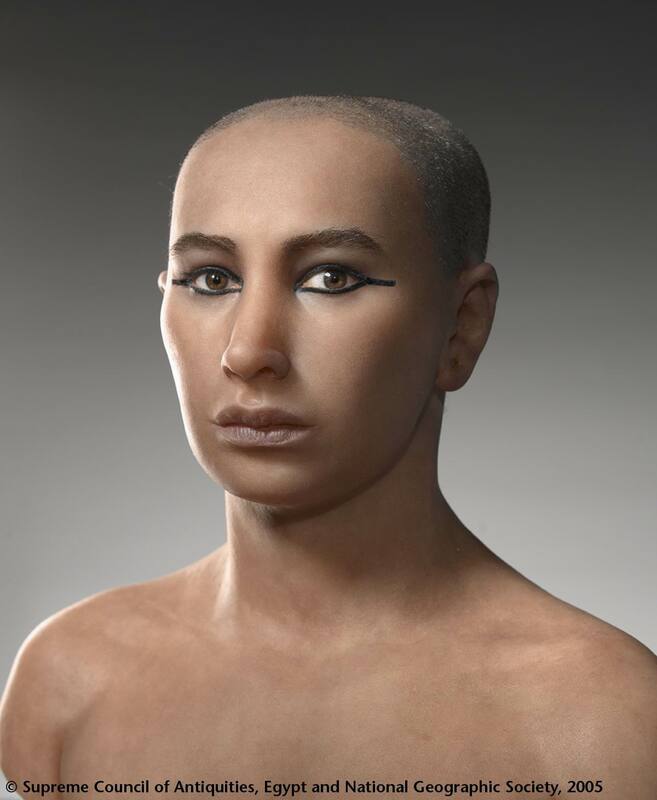 It is said that Queen Tiy was a commoner that Akhenaton's father married for love, if this is true, then Akhenaton could not have been completely inbred. Dynasty 18 Form: This is a painted limestone sunken relief. It is a picture of Akhenaton, his wife Nefertiti, and their three daughters. It has the rays of Aton extending into hands that hold ankhs to the Akhenaton's and Nefertiti's nostrils. They sit upon padded thrones and Nefertiti's throne has a stylized plant. All of the figures are rendered in a fairly naturalistic and almost caricaturish manner and the figures are interacting and touching. Iconography: The stylized plant on Nefertiti's throne is a symbol of a unified Egypt. This may be a symbol that she acted as a co-ruler with her husband. The rays of Aton are a symbol of his blessing and the hands holding the ankhs are a symbol that Aton is giving them the breath of life. The ethem of this sunken relief is one that emphasizes the joys of everyday existence. It is a genre scene (a scene of everyday life) featuring the royal family. 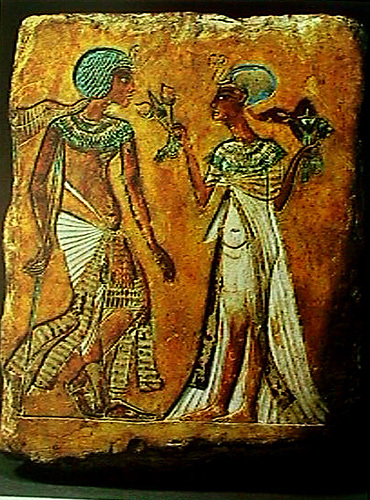 The genre elements, naturalism, and the interaction of the figures, (notice Akhenaton is kissing his child) are symbolic of Akhenaton's affect on the religion of Egypt. Context: This is one of the pieces that was revolutionary in its context because before the time of Akhenaton all of the art was tomb related. Since this scen shoes the royal family in an everyday kind of scene it demonstrates Akhenaton's influence on the art of Egypt. Dynasty 18 Form: This is another genre scene featuring the daughters of Akhenaton. It is a fresco. The daughters have exaggerated craniums but they are very naturalistic. The bodies are formed of curves rather than the hard plains of the previous royal families. It is a warmer, softer image and the composite view has changed slightly. Iconography: This piece symbolizes the very naturalistic way that the royal family can now be portrayed. Context: If Akhenaton's features are misshapen due to some genetic deformity then it would seem to make sense that his daughters would also have it. The fact that they are portrayed in the same stylistic manner as their father gives more evidence to the theory that it was a style. If it was a deformity due to inbreeding the chances that all three of the children would exhibit this deformity are low. Dynasty 18 Form: This is a painted limestone relief. Smenkhkare rests upon his staff with one leg behind him. Both of the figures bellies protrude and there bodies are very naturalistic, made mainly up of curvilinear lines. The detail of the clothing is very good. The skin tones are darker Iconography: The lapse in the god like depiction of the bodies of royalty is an icon that things have changed not only religiously but in the art and government as well. Now that the clothing has changed as well it is an icon that the style is evolving. Context: Smenkhkare was Akhenaton's half brother. he help his brother rule during the last few years of his reign. The pose that Smenkhkare is in was never seen before this painting. The lapse from traditional clothing is something not usually seen as well. It is art made for personal consumption. It was a private stele that was commissioned while they were alive. Smenkhkare 14th century BC king of the 18th dynasty of Egypt (reigned 1335-32 BC), probably in coregency with Akhenaton, his predecessor, for most of the period. He moved to Thebes from Akhenaton's capital, Akhetaton (modern Tell el-Amarna), and began restoration of the cult of Amon, the god of Thebes. As shown by medical and serological analysis of his mummy, Smenkhkare was almost certainly a brother of Tutankhamen, his successor. 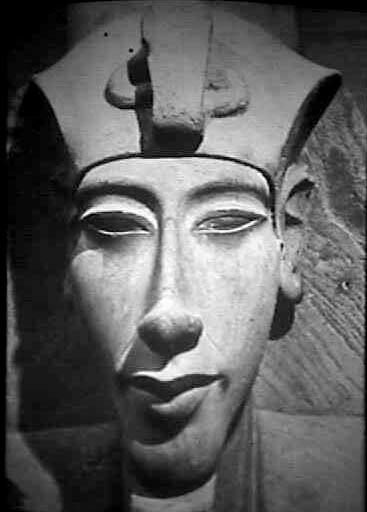 Akhenaton was certainly, and Tutankhamen was perhaps, a son of Amenhotep III, Akhenaton's predecessor; therefore Smenkhkare was possibly also his son. After the death or downfall of Akhenaton's queen, Smenkhkare was married to Akhenaton's eldest daughter and elevated as coregent. The length of the coregency is a subject of debate, and he may also have had a short independent reign. Some scholars believe that Smenkhkare fashioned a reconciliation with the supporters of Amon, whom his father-in-law had persecuted severely, and restored the Amon cult at Thebes. Dynasty 18 Form: The color is what makes this piece exceptional. The painted design of the band in the headdress beautifully matches her painted collar. Her face is highlighted and shaded beautiful, giving the statue true depth. She has a slender neck that slopes gently and a plumed crown. 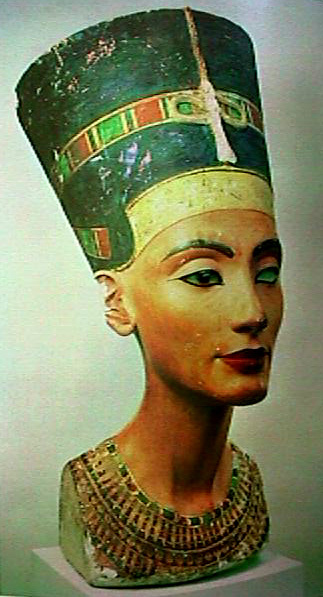 Iconography: Nefertiti is an icon for the ideal woman of the time. Her makeup is iconographic of the the cosmetics worn by women of the time. Context: This piece was found in the artist Thutmose's workshop along with other things that had been commissioned for the royal family. Busts like this one were rare, it may have been for the artist to base paintings on, it may have been meant to attach to a body, it may have symbolized a heavy flower on a thin stalk, or it may have been a rarity meant to stand as it is. 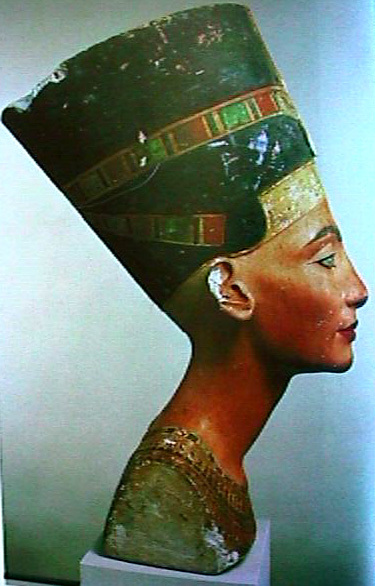 It is not a finished piece, Nefertiti's other eye has yet to be inlayed with a stone. Sunken relief: Is when the artist starts with a flat piece of medium and carves into it the figures. Thus, the figures are sunken into the medium. original name TUTANKHATEN, king of Egypt (reigned 1333-23 BC), known chiefly for his intact tomb discovered in 1922. During his reign, powerful advisers restored the traditional Egyptian religion and art style after the death of Akhenaton, who had led the "Amarna revolution." Medical analysis of his mummy shows that Tutankhaten was probably a brother of Smenkhkare, his immediate predecessor, and son-in-law of King Akhenaton, with whom Smenkhkare was coregent. As suggested by a docket from Tell el-Amarna (Akhenaton's capital Akhetaton) and other circumstantial evidence, young Tutankhaten probably became king after the deaths of Akhenaton and his coregent. Seals from Tell el-Amarna suggest that Tutankhaten resided there during his first year or two. He was married to Akhenaton's third daughter, probably the eldest surviving princess of the royal family, to solidify his claim to the throne. Because at his accession he was still young, his vizier and regent, Ay, who had ties with the royal family, and the general of the armies, Horemheb, became his chief advisers. Under their tutelage, Tutankhaten moved his residence to Memphis, the administrative capital, near modern Cairo, and restored his father's Theban palace. He also changed his name, at the latest by the fourth year of his reign, to Tutankhamen and issued a decree restoring the temples, images, personnel, and privileges of the old gods and also admitting the errors of Akhenaton's course. In spite of these capitulations to the Amon priesthood, no proscription or persecution of Aten, Akhenaton's god, was undertaken. Royal vineyards (up to the king's death) and elements of the army still remained named after the Aten. During the ninth year of Tutankhamen's reign, perhaps under Horemheb, the Egyptians marched into Syria to assist Egypt's old ally, the Mitannian kingdom of northern Syria, which was embroiled in hostilities with vassals of the Hittites. As reinforcements sent by the Hittite king hastened to aid his vassals, Tutankhamen unexpectedly died, aged about 18 years. Because none of his children survived, Ay succeeded him, perhaps marrying his widow. Dynasty 18 Form: The tomb was small and poorly decorated. It was laid out like a tomb of a minor official. Some time after his death, Tutankhamen's tomb in western Thebes (not his original, which Ay had appropriated for himself) was entered twice by plunderers who, however, were caught after doing only minor damage. 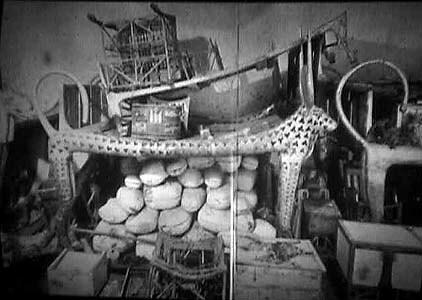 The burial chamber was not entered and remained intact until it was discovered in 1922 by Howard Carter, the English Egyptologist who excavated the tomb. When in the 19th dynasty the "Amarna kings"--Akhenaton, Smenkhkare, Tutankhamen, and Ay--were stricken from the royal lists and publicly condemned, the location of Tutankhamen's tomb was forgotten, and his relatively few monuments were usurped, primarily by his former general, Horemheb, who subsequently became pharaoh. 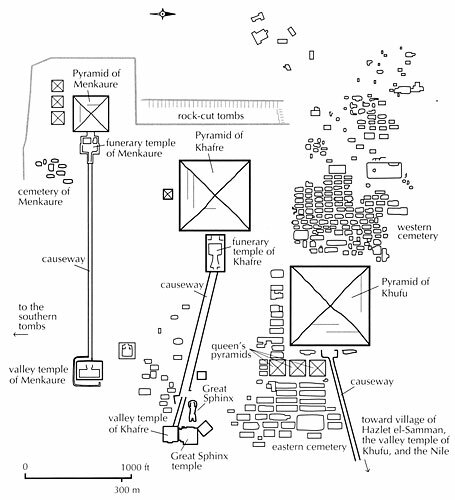 In the 20th dynasty, when the tomb of Ramses VI was cut immediately above that of Tutankhamen, the stone rubble dumped down the side of the valley covered the young king's tomb with a deep layer of chips. The workers of the 20th dynasty came close to Tutankhamen's tomb and clearly had no knowledge of it. 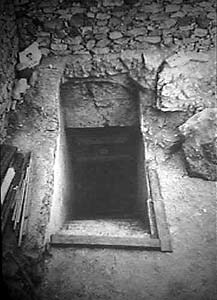 The tomb escaped the great series of robberies at the end of the 20th dynasty and was preserved until a systematic search of the Valley of the Kings revealed its location. 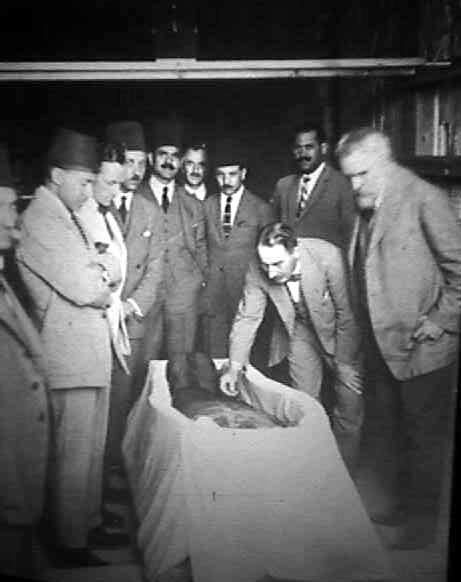 The tomb was found in November of 1922 by Howard Carter who was working for Lord Carnarvon. They spent a long time cataloging all of the treasures found in the tomb and their exact locations before most were transported off site. It is believed that because Tutankhamen died at such an early age that a minor officials tomb was converted to suit the needs of the dead king. Tutankhamen's lineage is not recorded but it is known that he married one of the daughters of Akhenaton. He came to power at the age of nine and turned his back on the reforms that were made by Akhenaton. 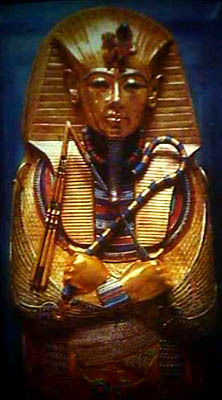 He reestablished the worship of Amen and changed his name to Tutankhamen which means "the living image of Amen." He restored art to the classic style but the influence of Akhenaton can still be seen in the art of this period. He died at eighteen of unknown causes and was buried in this tomb. The tomb was breached by vandals early on but the sealed inner chamber was never pilfered. Dynasty 18 Form: This is the inner most coffin of Tutankhamen. It is made of several hundred pounds of beaten gold that has been inlayed with enamel and semiprecious stones. The king wears a nemes headdress and a false beard. He holds a crook and flail. Iconography: The nemes headdress and false beard are symbols of kingship. The crook and flail are symbols of Osiris. Context: There were three coffins total. The body was mummified, wrapped, covered with a death mask, sealed in this coffin covered in charcoal, sand, and lime, sealed in another coffin, covered in charcoal, sand, and lime, and then sealed in the final coffin. The layers of charcoal, sand, and lime help seal the body and keep it well preserved. Inside his small tomb, the king's mummy lay within a nest of three coffins, the innermost of solid gold, the two outer ones of gold hammered over wooden frames. 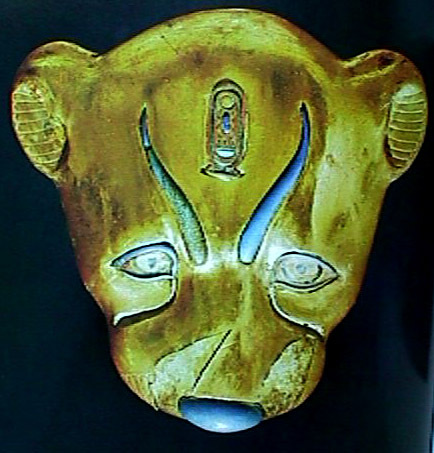 On the king's head was a magnificent golden portrait mask , and numerous pieces of jewelry and amulets lay upon the mummy and in its wrappings. The coffins and stone sarcophagus were surrounded by four shrines of hammered gold over wood, covered with texts, which practically filled the burial chamber. The other rooms were crammed with furniture, statuary, clothes, a chariot, weapons, staffs, and numerous other objects. But for his tomb, Tutankhamen had little claim to fame; as it is, he is perhaps better known than any of his longer lived and better documented predecessors and successors. 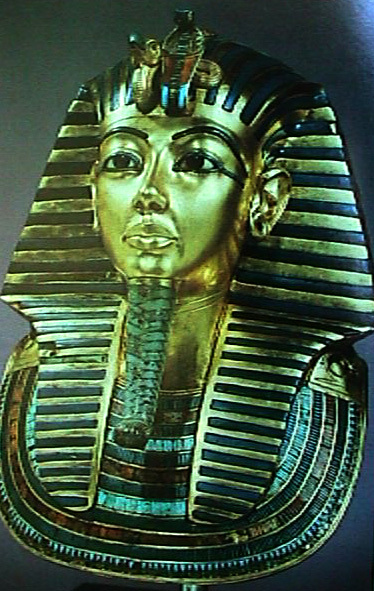 Form: The is Tutankhamen death mask. He wears a nemes headdress that has a royal uraeus and a vultures head on it. He also wears a false beard. Tutankhamen is depicted classically but with a naturalistic flare befitting the Akhenaton style. Iconography: This mask is an icon of protection. 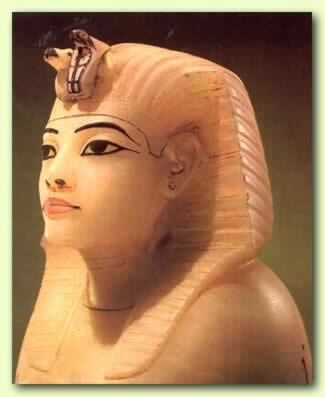 The royal uraeus and vultures head are symbols of Lower and Upper Egypt. The nemes headdress and false beard are symbols of kingship. Context: When making a mummy the body is cut from top to bottom and some of the organs are discarded. The ones that are saved are put into canopic jars. The brain is pulled out through the nasal cavity and then the body is buried in a sodium mixture to remove moisture. The mummy is then wrapped and dressed. Dynasty 18 Form: This is a portrait of Tutankhamen. He wears a nemes headdress that has a vulture in the forehead region. His features have been defined with black outlining. Iconography: This lid is an icon of the Egyptians ability to mix religion and art in a very successful manner. It is an icon of one of the spirits of Tutankhamen. The nemes headdress is a symbol of power and kingship. Context: This is one lid in a set of four. The four lids represent the four spirits of Tutankhamen. His organs are preserved in the four jars and the lids guard them. 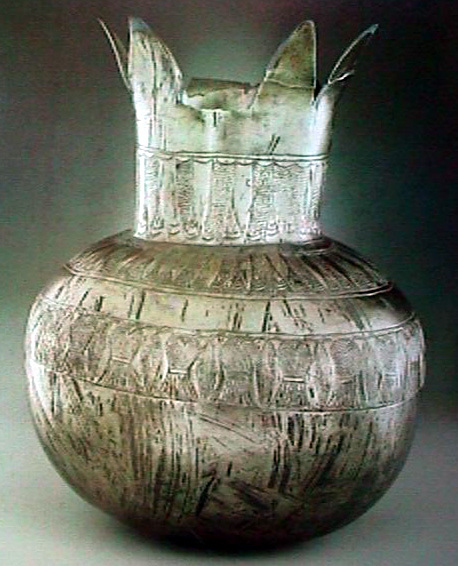 Dynasty 18 Form: This is a silver vase in the form of a pomegranate. Iconography: Pomegranates are often an icon of fertility due to their excessive red seeds. Context: Silver was very rare in Egypt at the time of Tutankhamen and was considered very valuable. Pomegranate's were also very rare, they were imported from western Asia. The combination of the two makes this piece a very rare contextual specimen. the dung beetle (Scarabaeus sacer). This beetle may be seen on sunny days forming a ball of dung and rolling it over the sand to its burrow, where the ball is consumed in the following days. The Egyptians apparently shared the widespread belief that the beetle lays its eggs in this ball of dung and saw in the life cycle of the beetle a microcosm of the daily rebirth of the sun; the ancient sun-god Khepri was conceived as a great scarab beetle rolling the sun across the heavens. The scarab also became a symbol of the enduring human soul as well, hence its frequent appearance, often with wings spread, in funerary art. Quantities of dead beetles have been discovered in burials of the earliest period, apparently to ensure the continued existence of the human soul; the later mummification of scarabs stems from the fact that they were sacred to Khepri at Heliopolis. Scarabs of various materials, glazed steatite being most common, form an important class of Egyptian antiquities. Such objects usually have the bases inscribed or decorated with designs and are simultaneously amulets and seals. Though they first appeared in the late Old Kingdom (c. 2575-c. 2130 BC), when they evolved from the so-called button seals, scarabs remained rare until Middle Kingdom times (1938-c. 1600? BC), when they were fashioned in great numbers. Some were used simply as ornaments, while others were purely amuletic in purpose, as the large basalt "heart scarabs" of the New Kingdom (1539-1075 BC) and later times, which were placed in the bandages of mummies and were symbolically identified with the heart of the deceased. A winged scarab might also be placed on the breast of the mummy, and later a number of other scarabs were placed about the body. The seal type of scarab was, however, the most common, and many clay sealings have been found attesting to this use. Spiral motifs and titles of officials are characteristic of Middle Kingdom examples, while on later scarabs a wide variety of designs and inscriptions is found. The inscriptions are sometimes mottoes referring to places, deities, and so on or containing words of good omen or friendly wishes. Historically, the most valuable class of scarabs is that which bears royal names; these ranged in date from the 11th dynasty to the Late Period. The names of the Hyksos dynasts have been largely recovered from collections of scarabs. A related type of seal amulet, called by Egyptologists the scaraboid, was similar in shape but lacked the details of the beetle's anatomy. 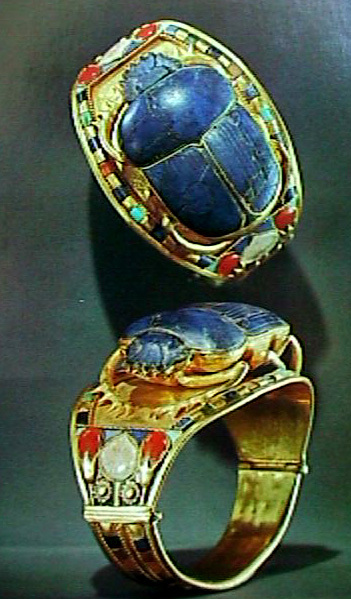 Egyptian scarabs were carried by trade throughout the eastern Mediterranean and to Mesopotamia. Numerous examples of Greek and Etruscan imitations have also been found. 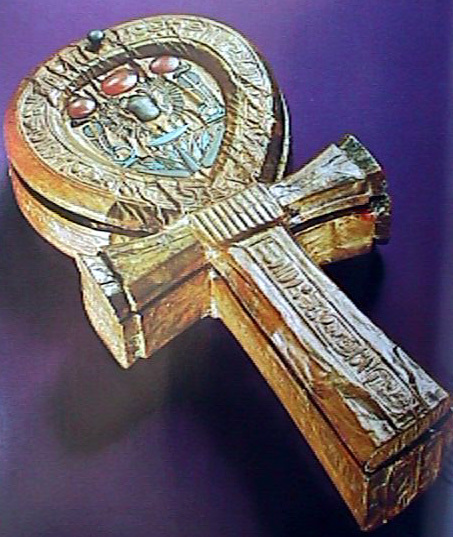 Dynasty 18 Form: This is a box in the shape of an ankh that would have held a mirror. It is inlayed with precious stones. Iconography: Ankhs are commonly symbols of life or the concept of life. Because it was an object created for Tutankhamen it may also be a symbol of his power to give or take life from his people and enemies. Context: An ankh is a hieroglyph that represents part of a sandal. The round part would surround the foot, the arms would span the width of the foot, and the long part would come up between the toes. Mirrors were sometimes also referred to as ankhs so the artist that devised this piece may have been trying to be clever. ancient Egyptian hieroglyph signifying "life," a cross surmounted by a loop and known in Latin as a crux ansata (ansate, or handle-shaped, cross). It is found in ancient tomb inscriptions, including those of the king Tutankhamen, and gods and pharaohs are often depicted holding it. The ankh forms part of hieroglyphs for such concepts as health and happiness. The form of the symbol suggests perhaps a sandal strap as its original meaning, though it has been seen as representing a magical knot. As a cross, it has been extensively used in the symbolism of the Coptic Christian church. Dynasty 18 Form: This is a portrait of king Tutankhamen as a young man. It features his head upon a blue lotus flower. It is a painted sculpture. Iconography: Here the king is represented as an icon of Osiris. It is an icon of birth or rebirth. 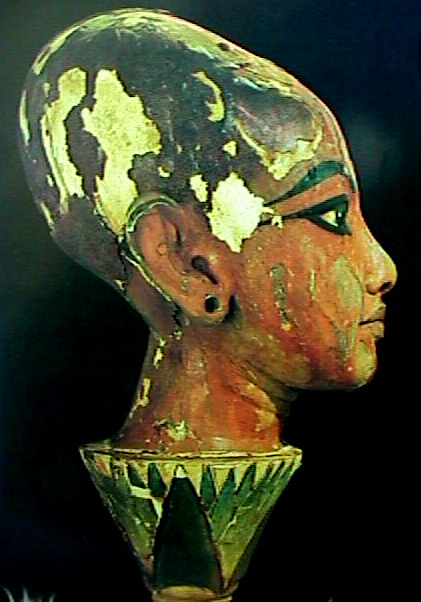 This head is also an icon of the divine status of Tutankhamen. Context: This piece was discovered in the corridor of the tomb. According to the Egyptian religion, the sun god, Osiris, emerged from a lotus flower that was in the primordial ocean. Dynasty 18 Form: This chest is made of wood that has been painted. It features a scene, on the top of the chest, that shows the young king as a great hunter. On the front of the box and shown in the detail on the left is the king riding in a chariot with his bow drawn. Behind him are three more standards containing men and chariots. In front of the king are his enemies who are being trampled by his horse and slaughtered by his strength and power. Iconography: The men and chariots that are behind the king, in standards, are iconographic of his large support and the organization of his armies. The size of the king is iconographic of his strength and power. The chaotic scene to the right of the king is iconographic of his enemies non organization and of his superiority over them. 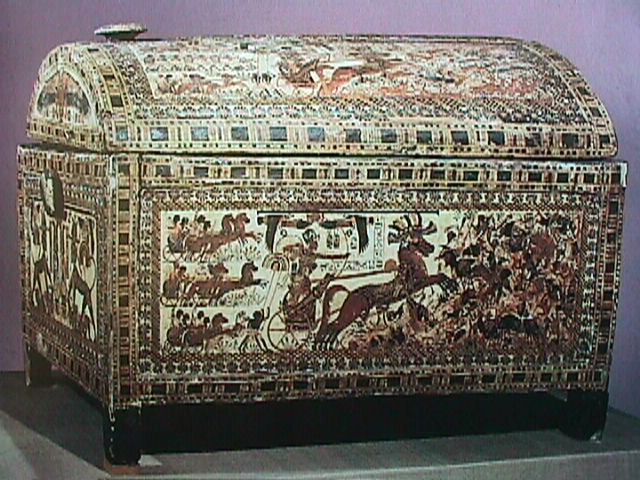 Context: The king did not live very long and the probability that he took place in a fight, like the one featured on this chest, is small but as king he is expected to be displayed in this manner. The Akhenaton influence in this picture is small but on the side of the enemies the organization is reminiscent of that style. The movement in the picture plane is also akin to Akhenaton style. Dynasty 18 Form: This stool is in the duck style, due to the shape of the legs. The siting area is leather that has been made to look as though it is leopard skin. 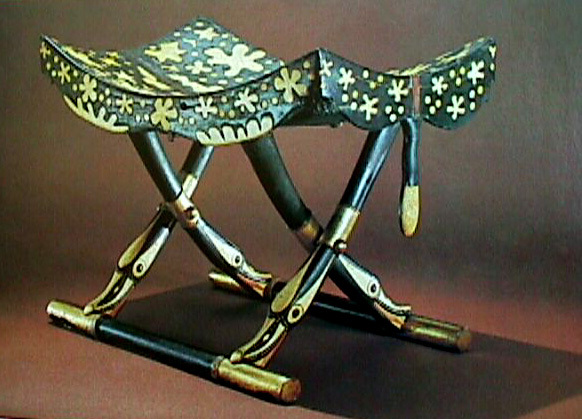 It is a foldable stool that is made of ebony that has been inlayed with ivory and parts of the stool are done in gold. Iconography: This piece is iconographic of the time, thought, luxury and wealth that was spent on a common piece of furniture that was made for the king. Context: Twelve stools of six different styles were found in Tutankhamen's tomb. Dynasty 18 Form: This piece was carved from wood, coated with gesso, and then overlaid with gold. It is a clasp that is in the shape of a Leopard head. Iconography: Leopards are symbols of power. Context: This piece would have been used to secure Leopard skins onto the body of the king Tutankhamen. Dynasty 18 Form: This piece is carved from a single piece of alabaster. It has a jaguar on the lid that is grooming itself. The same jaguar is depicted on the jar killing another animal. Iconography: The piece is iconographic of the the power of the jaguar and the oil would then instill power in the wearer. Context: This piece probably original held perfume or oils. These oils were used in funeral rituals and in everyday life by royalty. Dr. Zahi Hawass, Secretary General of Egypt’s Supreme Council of Antiquities, announced today the results of three independent attempts to reconstruct the face of Egypt’s most famous king, Tutankhamun. These likenesses are based on CT scan data collected by an all-Egyptian team, led by Dr. Hawass, using a portable CT scanner provided by the National Geographic Society and Siemens AG. The scan took place on January 5, 2005, in the Valley of the Kings in Luxor. The fragile body of the king, which had lain undisturbed since it was last X-rayed in 1978, was carefully carried to the scanner inside the wooden tray of sand in which Carter had left it in 1926. The CT scan was able, with minimum disturbance of the mummy, to distinguish different densities of soft tissue and bone. During the scan over 1,700 high-resolution images were captured; these were then used to create three-dimensional models, both virtual and actual. Results from the analysis of the CT scan were announced on March 5 of this year. The scientific team concluded that Tutankhamun was about 19 when he died. He was well-fed, and showed no signs of childhood diseases or malnutrition. The team found no signs of a blow to the head, as had been theorized based on X-rays taken in 1968, and no other evidence for foul play. They did note a bad fracture just above the left knee that may have occurred a day or two before the king died (rather than being caused by the embalmers or Carter’s team). “It is possible that this injury became infected and killed the king,” says team leader Zahi Hawass. All three teams started with the CT data provided by the SCA. 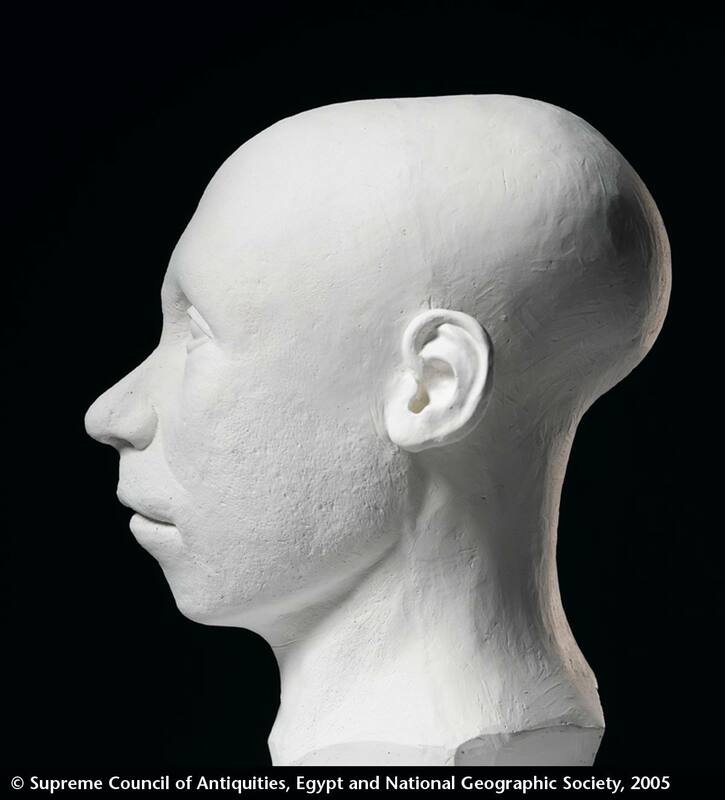 The American and French teams were given a plastic model of the skull produced in Paris; the Egyptian team made their own model directly from the data. Based on this skull, the American and French teams both concluded that the subject was Caucasoid (the type of human typically found, for example, in North Africa, Europe, and the Middle East). The American team, working blind, correctly identified the subject as North African. Based on the racial type, the teams added clay to the plastic models and used these as a guide to sculpt the features. The French and Egyptian sculptors also made reference to ancient images of Tutankhamun. 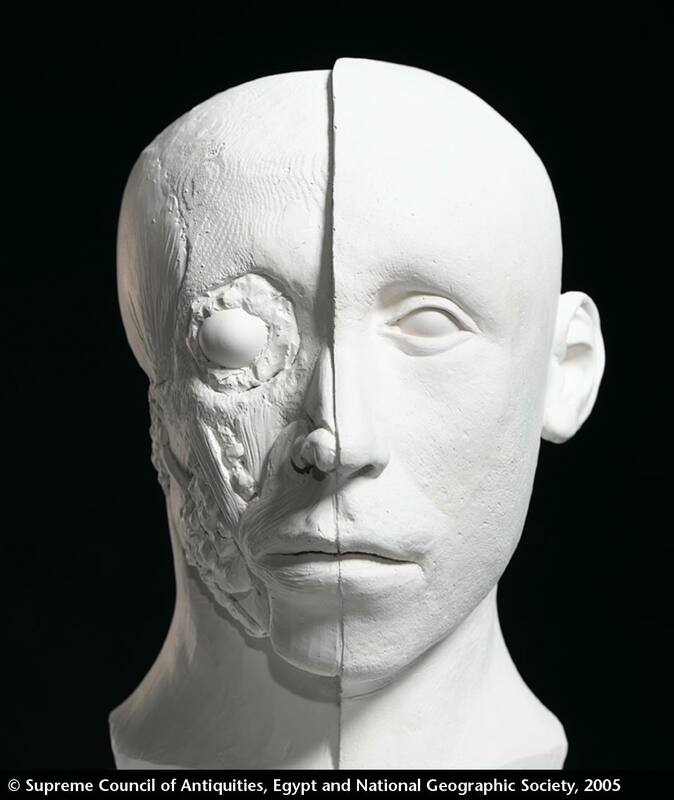 When her clay model was complete, the French sculptor made a silicone cast and, based on the archaeological information, added glass eyes, hair, and color to the skin and lips. The results of the three teams are identical or very similar in the basic shape of the face, the size, shape, and setting of the eyes, and the proportions of the skull. The primary differences are in the shape of the end of the nose and ears. “In my opinion, the shape of the face and skull are remarkably similar to a famous image of Tutankhamun as a child, where he is shown as the sun god at dawn rising from a lotus blossom,” says Dr. Hawass. 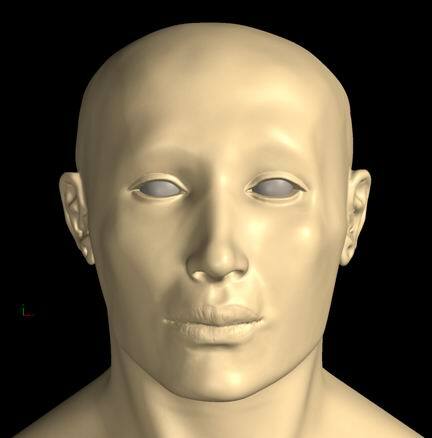 This is confirmation that the science and techniques of forensic reconstruction can be a useful tool for reconstructing the likenesses of people who lived long ago. The team of radiologists will start next month on the process of identifying another five mummies that were also scanned on January 5, 2005. These are the mummy of a child from the tomb of Tuthmosis IV, an unidentified mummy from the tomb of Seti II, and three mummies found in a side chamber in the tomb of Amenhotep II (an older woman, a youth, and a third mummy recently speculated to be Queen Nefertiti). This work will be carried out as part of the Egyptian Mummy Project, a five-year study led by Dr. Hawass to inventory and scan all of the known mummies in Egypt. The project will continue to inventory the non-royal mummies in Egypt. No one knows how many of these there are, as they lie scattered at sites and in museums and storage magazines all over the country. These mummies, which include those from the Valley of the Golden Mummies, will be classified and scanned. The final stage of the project will be the scanning of the royal mummies now exhibited at the Cairo Museum. The Supreme Council of Antiquities is currently building a National Museum of Egyptian Civilization in Fustat City in Old Cairo. The royal mummies from the Cairo Museum will be exhibited individually, each with a display explaining the history of the king and his period. Each pharaoh will be accompanied by images from his CT scan and a reconstruction of his face. “For the first time, we will make these dead mummies come alive,” says Dr. Hawass. Dr. Zahi Hawass adds that. “The Egyptian team is led by Dr. Khaled G. El-Said, a biomedical engineer based in Boston who makes medical models. 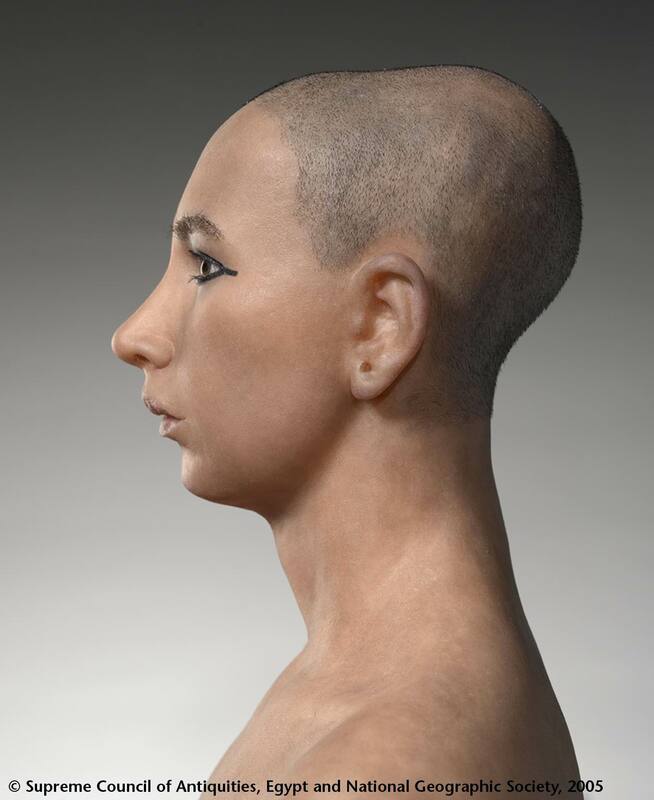 Using the CT data made a model of the skull of King Tut. 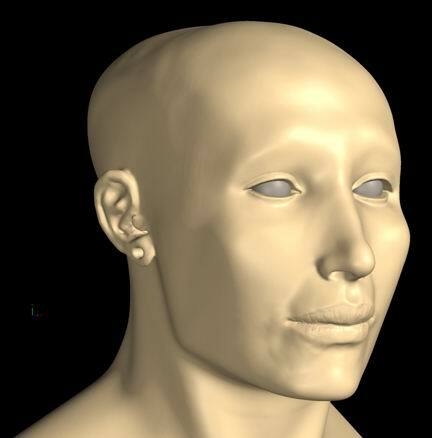 Then with the assistance of a detective from Boston, his team also made a reconstruction of the face. The three reconstructions (French, America and Egyptian) are all very similar in the unusual shape of the skull, the basic shape of the face, and the size, shape and setting of the eyes. The noses of all thee are different, although the French and the American versions are more similar to each other than the Egyptian. Also, the chin is similar in the American and the French reconstructions; the Egyptian reconstruction has a stronger jaw and chin. In my opinion as a scholar, the Egyptian reconstruction looks the most Egyptian, and the French and American versions have more unique personalities.